To celebrate the release of The Traitor, Sourcebooks is giving away five (5) historical romance novel bundles featuring Grace Burrowes, Katie MacAlister and Shana Galen. Enter via Rafflecopter below. Millicent Danforth desperately needs her position as companion to the Traitor Baron’s aunt, but grieves to learn that Sebastian must continually fight a war long over. As Sebastian and Milly explore their growing passion, they uncover a plot that will cost Sebastian his life and his honor, unless he does battle once more -- this time in the name of love. Click here to read the first 3 chapters of The Traitor at Grace Burrowes's website. Sebastian St. Clair is the real name of Robert Girard, a character I really, really hated when we read about him in Christian's book (The Captive). When I found out he was the hero of the second book, I wondered how Grace Burrowes would accomplish such a task: What would it take for me to forgive him of the atrocities he committed during the war? What would it take to convince me that he is a man worthy of someone's love and affection? What would it take to convince me that he deserves a happy ending? I didn't want an easy way out for Sebastian. I didn't want tabula rasa for him: I wanted his path to redemption to be as slow, painful as arduous as the torture he inflicted on Christian -- it is a testament to Grace Burrowes's perceptiveness to choose this particular road for him. There is no clean slate for Sebastian St. Clair -- he is indissolubly inscribed/etched/scratched with the past. I would not have wanted to be in Sebastian's position -- to wake up every morning, with the sense of impending doom: will he be challenged to another duel? Will his enemies decide to take a less honourable way of avenging themselves against him? Add to this, Sebastian is burdened by the nightmares of his choices and his current life. While the English have gone home from war (leaving it in France), Sebastian has come home to it in England. What is remarkable about Sebastian is that he understands -- that he has a role to play in resolving the stories of many English soldiers. Not once does he lash out, or speak indignantly of his rights and honours. He quietly bears the consequences of who he is. Milly is a well-crafted and well-thought-of character. Sebastian needed a woman who would not ignore or avoid his past, but to find a way to accept it as part of the total man. Milly had been at the receiving end of betrayal and poor treatment from her relatives, who were entrusted with her care and well-being. Instead, she was treated worse than a servant because she was unpaid. And she suffered beatings as well because she was illiterate. The term "illiterate" has been examined in The Traitor: Milly's relatives took such great stock in the ability to read and write as though they were the end-all and be-all of a person. They saw Milly as less than they were because she could not learn things the way she was expected to. Grace Burrowes holds up a mirror to society, and we see the irony of the situation. Milly was so, so much more than Alcorn and Freida (her relations) and she had an incredible, incredible gift that just wasn't appreciated. In that Sebastian and Milly are a perfect match -- they are both misfits, but, they fit together wonderfully. Sebastian didn't want to love Milly, didn't think he was worthy of something so divine or sublime, but Milly perfectly understands the necessary choices we make in life in order to survive. She has had to leave the warmth of her aunts's home and enter service. Her experience is only a very tiny fraction of the difficult choices Sebastian has had to make to survive the war. "I think you know more than you should about waging war with silk and jewels, but turquoise or sapphire will go better with our colouring if you're set on wearing the new dress." "Good morning, Miss Danforth. May I join you for a moment?" Because a proper interrogation was conducted with proper respect for the person questioned. She had good taste in flowers. Many knaves and whores did, as did some traitors. "Do you mind if I play?" "Of course not, my lord." A slight misstep on his part. If he didn't ask permission to sit, he probably ought not to ask permission to use his own piano. He started off with a few scaled, mostly to draw his not entirely quiet mind from the scent of lavender and the sight of graceful female hands toying with flowers and greenery. "Might I inquire as to your last position, Miss Danforth?" She clipped off a few inches of a thorny rose stem. "I was companion to a pair of my aunts, my lord." Again she did not chatter. She was a woman who understood the proper tempo of an interrogation. "Lead on, Sebastian, and tell me about your parents." He took her hand, and she hadn't even had to ask. "You're to interrogate me?" We often use the term "blind acceptance" to accept something without question, and it got me thinking if there is an opposite to it, because that is what Milly and Sebastian do: their romance doesn't skirt around the issues, but forces our hero and heroine to wade through the mire. This is a couple whose relationship was tested in fire and it has come through it stronger. 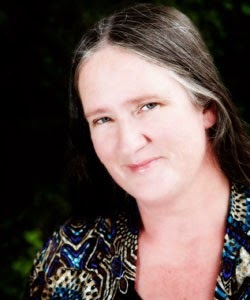 Grace Burrowes is an author who understands the complexities of life and love and boldly explores them in her love stories. The Traitor displays such a profound degree of insight into war and survival, about traitors and heroes, about loss and gain -- it's a truly breathtaking and remarkable story. 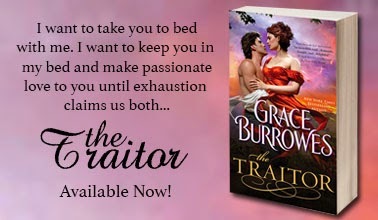 The Traitor is the second book in Grace Burrowes's The Captive Hearts series and was released today, August 5. Disclosure: I received this review copy for this event. Thank you to Grace Burrowes and Sourcebooks for the opportunity. Yes, this is an honest review. It's a really, really nice book Dalila. When I started reading it, I was worried about how I would react to Sebastian -- but Grace Burrowes is brilliant in how she is able to flesh out his character and backstory. Although I sometimes question the appropriateness of some of the author's vocabulary and her characters' attitudes as being out of sync with the time period, that's a small quibble when I always, always become immersed in the story and forget minor discrepancies in the sheer joy of reading. To answer the contest question, I would be an Operative since my real life never matches my imaginary one.